← Quick update on the Fish Cardigan! Brown belt and internet woes. Belts make all the difference: even a simple shirt can have that smarter and classier look if you choose the right belt to complement it. Never take advantage of your friends or family’s hospitality. As Jessica herself says: “A good guest is like Halley’s Comet: seen and enjoyed seldom and briefly”. Joaquin Phoenix and his sister Summer starring as Jessica’s grand-nephews. Ok, ok, I must confess: my boyfriend noticed their names in the end titles and here I am taking all the credit! 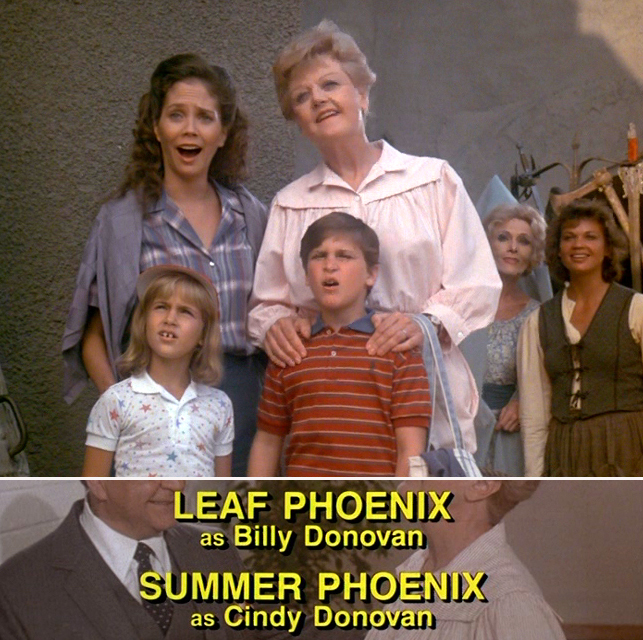 Apparently actor Joaquin Phoenix was credited as Leaf Phoenix in his early roles (source: Wikipedia). 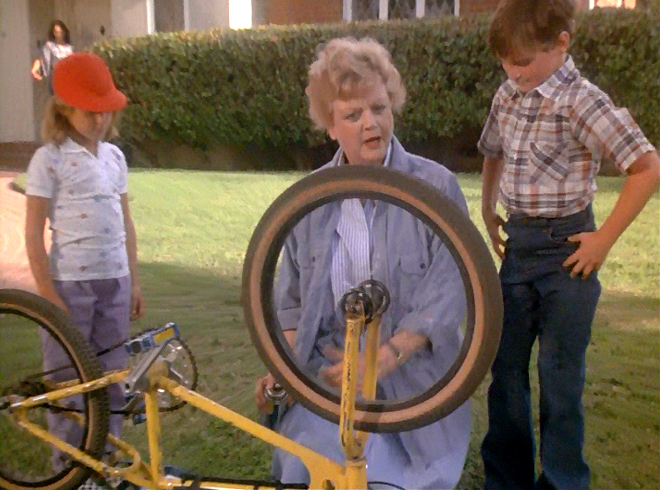 In 1984 he would have been 10 years old and this small part in Murder, She Wrote is one of his first appeareances on screen, along with his sister Summer. They are both adorable and already so talented! In this episode, Jessica is staying with her niece’s family when she gets involved in solving the murder of a very arrogant and unpleasant businessman. He had previously tried to convince her to create a horror attraction for his theme park, but she found this idea totally preposterous! In most of the scenes of this episode Jessica is wearing clothes we have seen before (pinstriped shirtdress, buttoned blue shirt, grey tracksuit, floral scarf… and so on) but the first ‘new’ outfit that attracted my attention is this simple pairing of a pencil skirt and double-layered shirts (a striped pink one under a more thick-looking khaki one) all tied together by a lovely brown belt. I really think it is the belt that makes this outfit. Jessica’s brown belt seems to have a round buckle, so I picked this tan belt by Urban Outfitters and this similar belt by Dorothy Perkins, but the choices would be endless. A pink striped shirt is quite easy to find, so I picked this classic 100% cotton shirt available at M&Co, or this short sleeved one available at Yoox, which has a pretty twist on the theme with an added gold line. On top of this first shirt, Jessica wears another one, similar to this khaki shirt available at Dorothy Perkins, which is a bit more modern thanks to its shoulder embellishment. As per Jessica’s pencil skirt, I found this beautiful vintage Valentino on sale at only £80 at Farfetch, which I think it is a great bargain. I must confess: I had never seen before a skirt suit (or two pieces dress?) quite like the one Jessica is wearing in the next screenshots. As it has proved very difficult to find something like it, I tried to make up for it picking dresses which have at least a somehow similar pattern, such as this skirt suit at Oxfam, this 1970 cocktail dress available at Beyond Retro and this polka dot shirtdress by Ruche. Under it, Jessica wears a simple white top, such as, for instance, this sleeveless one by La Redoute and a red beads necklace like this lovely hand knotted necklace by Etsy seller BeadDweeb. I really like Jessica’s airport outfit in this episode. Jessica wears a beautiful white pleated skirt, like this vintage 1980s by Etsy seller Wildrose Primitives, or this vintage 1960s by Etsy seller Otra Vez Vintage. On top of it, complemented by the same brown belt we saw above, she wears a simple navy shirt, like for instance this roll sleeve linen shirt by Matalan or this more casual lightweight cotton shirt available at John Lewis. As a final touch, Jessica wears a multicoloured scarf with a checkered pattern. Somehow on a similar vibe, I like this pastel vintage scarf by Etsy seller Vintage Threadz and this vintage Vera Neumann scarf by Etsy seller Blue Sky Lane. 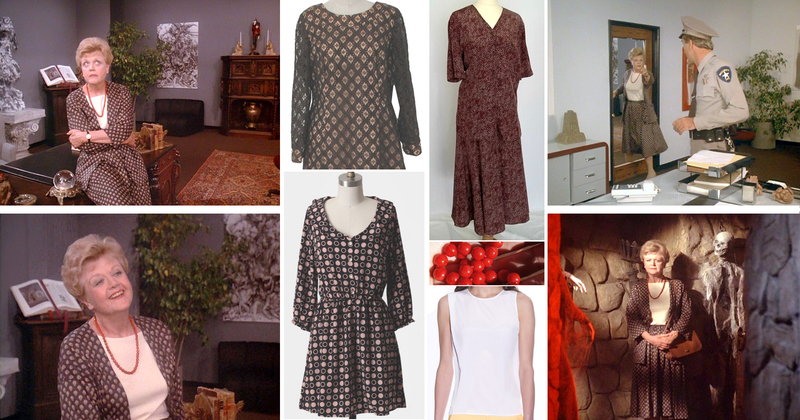 This entry was posted in Episode 08, Series 1 and tagged classy, etsy, fashion, jessica fletcher, joaquin phoenix, murder she wrote, outfit, oxfam, vera neumann, vintage. Bookmark the permalink. That khaki and pink colour way is great, always modern. I lovelovelovesuperlove the pink striped oxford. I love it!! 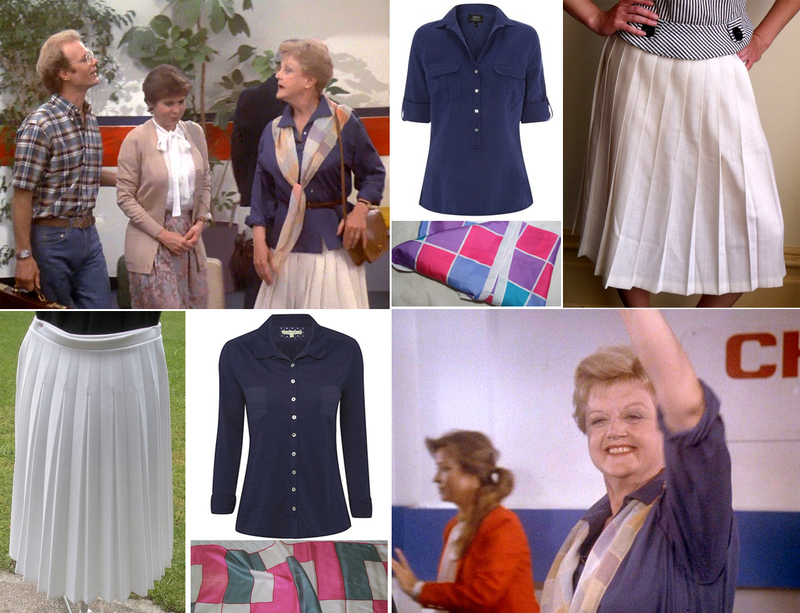 I’m still watching my way through Murder She Wrote, but every time you post I feel like I learn more about the show – and fashion. Win win. Thank you (and a pox on your internet service provider)! Thank you so much!! I am learning so much whilst writing this blog so I am very happy if you find it interesting! Will there be more posts? I’ve just randomly started watching MSW on Netflix and just entered Season 2–can’t wait to read your reactions to the season premiere! Sorry for the delay and thank you for reading!! Yay! I’m actually getting someone to make me a fish sweater, in red! Wonderful!! Can’t wait to see the photos! 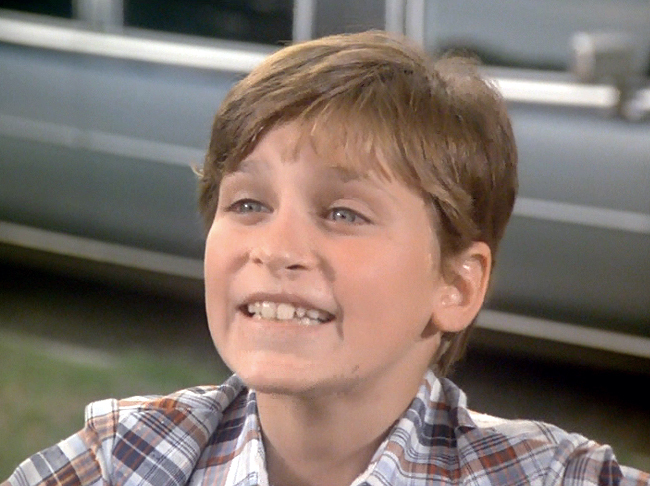 Loving Joaquin at all ages…! Home is where the Bard is.